First Make Spinach puree,wash spinach thorughly in running water, then chop it roughly and keep ready. In a wide vessel, add chopped spinach, garlic, ginger and green chilli and sprinkle some water(couple of tbsp of water) and cook for 4-5 minutes. Then in a mixer jar add the cooked spinach-ginger-garlic and blend it to a smooth paste and keep ready. Now in a mixing bowl, add wheat flour, salt and sugar mix well and make a dent and add spinach puree. 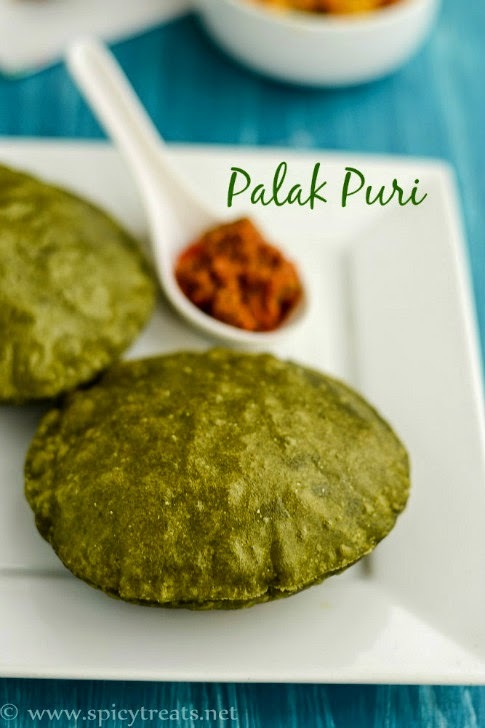 Do not add water, palak puree is enough to knead it to a soft and smooth dough. Cover the dough and let it sit for only 4-5 minutes. Mean while heat oil in a kadai to deep fry palak puris. And now divide the dough into 8 equal portion and roll each into 7" medium thick disc. When the oil is hot, check by dropping a small piece of dough into the oil and when it comes up immediately then it is right time to fry the puris. Then gently drop the rolled disc one at a time and using a slotted spatula gently keep pressing the poori. Do repeat the same procedure for remaining rolled disc and fry the pooris. That's it...Palak Puri is ready. Serve Hot with Mango pickel or any desired sabzi. 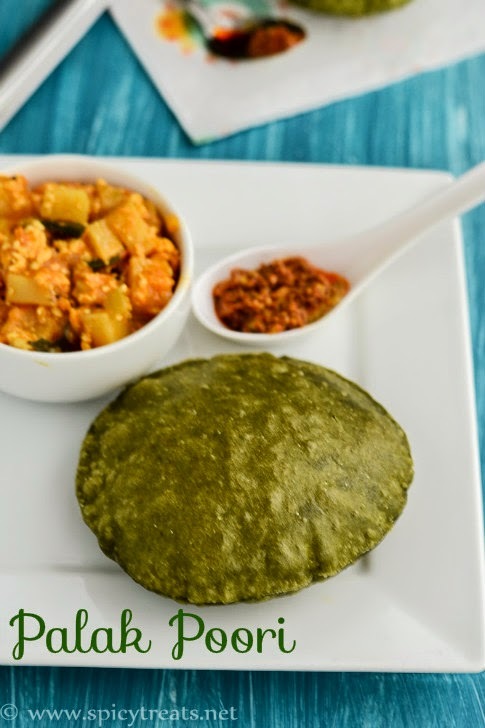 I served with Ridge gourd Aloo Paneer sabzi. For Blanching : Bring 2-3 cups of water to boil, when it starts boiling add spinach leaves and let it cook for 3 minutes, then drain the leaves and run in cold water and grind the blanched spinach leaves with green chili, ginger and garlic if desired. You can also add 1-2 tsp of semolina/sooji to the flour. 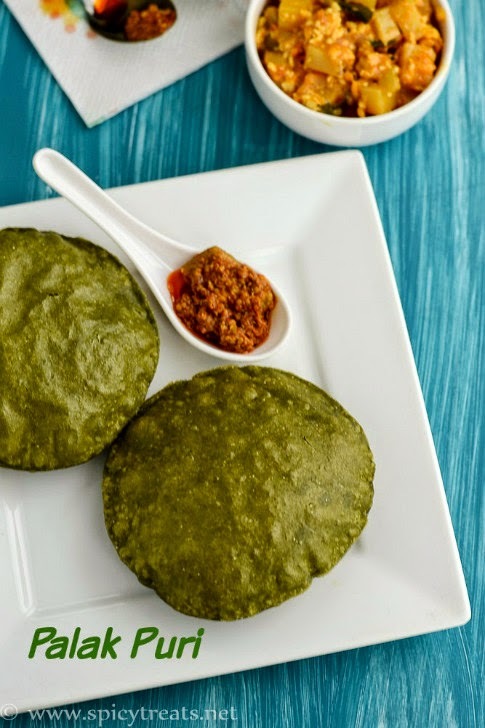 Make it a tight and soft dough, add puree as needed and use the left over puree to make Palak Paratha or in rasam, sambar, soup. Inviting and delicious Puri... Beautiful color.. 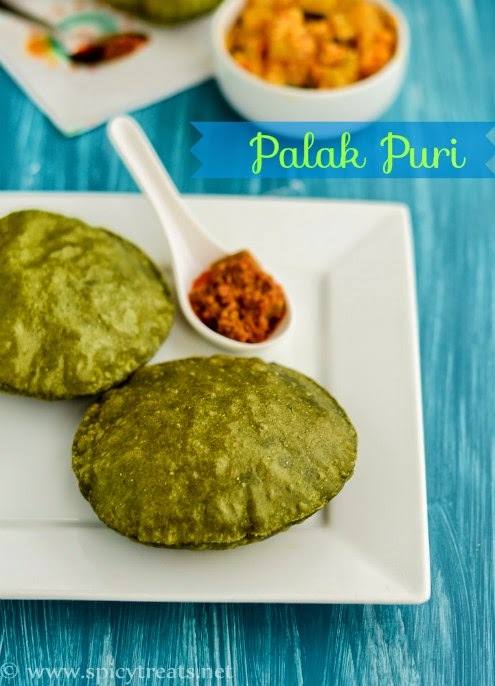 I ve been looking for the right Palak puri recipe and this looks perfect. Nice looking pooris Sangeetha. Perfect puris. Looks so inviting. Very tempting pooris. Such a delicious looking fluffed up pooris! 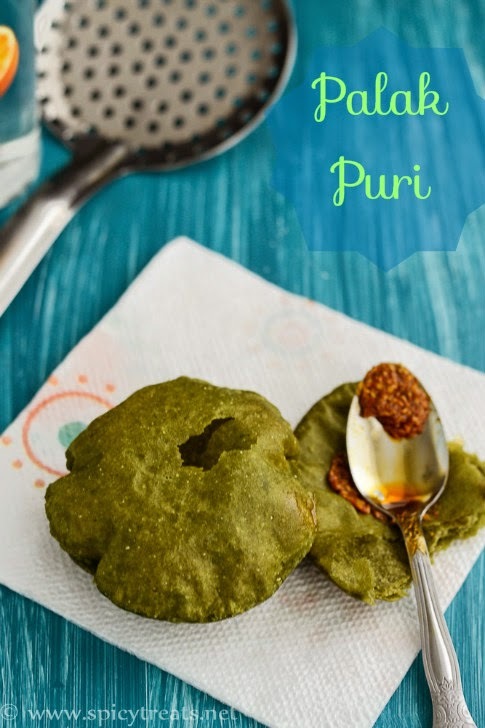 Kids would definitely love this, the green puris look so inviting..
Picture perfect, colorful pooris is tempting me!